Spanish Bananagrams is my family’s favorite word game. We’ve played since my children were little, and it is always a part of our family gatherings. In addition, the physical game itself, the set of tiles with letters, is one of the most versatile Spanish learning materials I own. 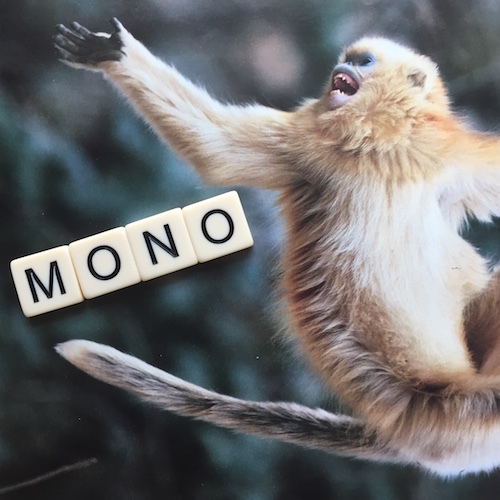 I’m sharing some of the different ways I use Spanish Bananagrams with kids, but I am sure you’ll find more as you play. The possibilities are endless! Spanish Bananagrams is available on Amazon. 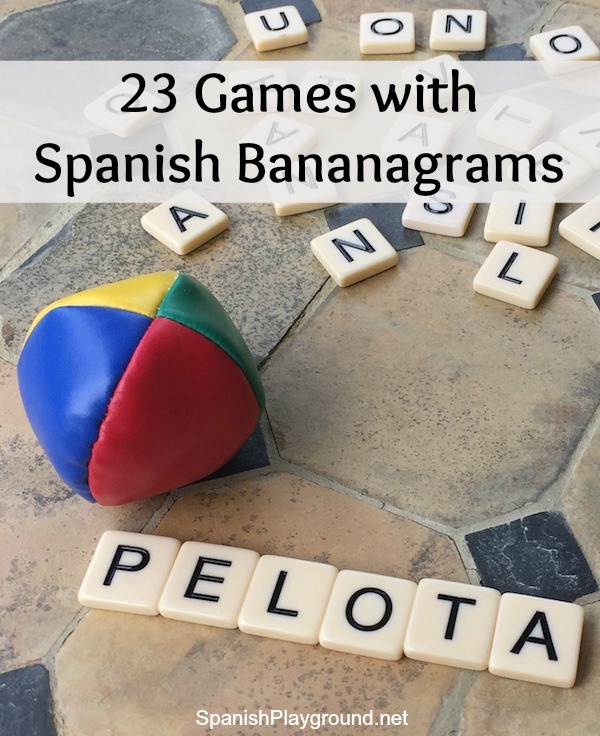 Download a printable list of games using Spanish Bananagrams. The physical design of Spanish Bananagrams is an important part of why it is so useful and appealing. The selection of letters accurately represents the letter distribution in Spanish, so it is easy to form words. The percentage of vowels is much higher than in English. This really matters! There are lots of letters! In the original game, everyone plays at once, so regardless of how you play, there are enough letters for several children. The tiles make Spanish a hands-on experience. Children connect with the sound of language differently when they can handle the letters and rearrange them as they play. The tiles include the combinations ch, ll, and rr on single tiles, as well as the individual letters. Although the Real Academia Española no longer considers these letter combinations single letters, it is very helpful for children learning the sounds of Spanish and working with syllables to have the two letters on one tile. The tiles are made to be turned over. They are thick enough to be easy to grasp and flip. The game is virtually indestructible. The weight, shape, and smooth texture makes the tiles fun to play with and easy to handle. Kids love them! The tiles slide and stack, so you can use them for a range of activities. Spanish Bananagrams is easy to carry and play anywhere. The true Bananagrams game is excellent for native speakers or Spanish learners. At the end of this post you’ll find suggestions for supporting kids as they play the original game. Language learners of any age have fun with Spanish Bananagram tiles. Adapt these ideas to the number and ages of the players. Stack, build and make patterns with the tiles. Name the letters as you do. Sort and stack the tiles by letter. Put the tiles in alphabetical order. Separate the set before you start. Say the letter name and slide the tiles across the table to each other, or try to slide them into a circle on the table (you can use chalk, tape, whatever works for your surface). You can use letters from a specific word or random letters. Start with all the letters face up and say the letter names as you turn them face down. Do variations such as turning and saying them as fast as possible, or saying a word that starts with the letter as you turn it. Drop the Spanish Bananagram tiles into a glass or bowl of water as you say the letter names. Put the tiles into a clear plastic bottle and add rice. Turn the bottle to reveal the tiles and name the letters. Play with the tiles in the bathtub. Line them up on the edge and say the letters or make simple words. Build favorite words from books. Kids look at the word on the page, find the letters and then build the word. Choose a winning word to make. Start with 7 tiles. Alternate drawing letters, always discarding after you draw. The first to make the word wins. Use the tiles face up to play Ahorcado (Hangman). Make words for things you can see in the room. They do not have to connect. Place the tiles face up and draw at will. The first to make 3 or 5 words wins. Play a vowel race. Give each player the 5 vowels. Place the tiles face up and draw at will. The first to make a word that contains each vowel or the first to make 3 words that start with different vowels, wins. Say words for kids to spell. Let them tell you words and spell them. Play ¿Qué palabra es? Make a word and leave one letter (or two) face down. The other player guesses the word. Work together with 10 or 15 letters to make as many words as possible. You will want to list the words on paper as you form them so you remember what you have made. You can do this with different sets of letters and then switch to see who can make more words with the different sets. Each player draws 7 tiles. One person plays a word (and draws from the pile to replace her letters). The next player makes a word crossword-puzzle style off the first word and then removes the unused letters from the first word. Playing this way there is always just one word to play off and no obstacles. It is a great game for language learners. Make a 5-letter word, a 4-letter word, a 3-letter word, a 2-letter word and a 1-letter word. The words are not connected. Make a word and stack the tiles with the first letter on top. Kids try to guess the word as you reveal the letters one by one. Form words in a category – choose a category and everyone tries to make words. Or one person forms words and other players try to guess the category. Put squares (number of letters) on coloring sheets, for kids to make words. – can trace the tiles. Use the tiles to label pictures for magazines or objects. Put squares for the tiles on coloring sheets for kids to label parts of the picture. You can trace the tiles to make these. Trace and then make copies to use them again later or for a group. The game Bananagrams, played according to the instructions, is a excellent game for native speakers or Spanish learners who have acquired a base vocabulary to draw on. For beginning learners, try the games I suggested above. In the original game, players try to use all their letters in words so they can draw more letters (forcing their opponents to draw more, too). It is important to make short words to use up letters, draw, and then rearrange the letters to make new words. Help Spanish learners with this strategy by reminding them of two-letter words they know. They can use up their letters by adding a consonant or vowel to the letters they used in longer words, so they can draw again. They can then rearrange the letters into longer words. You may want to write out a list of two letter words to help them: al, da, de, di, el, en, es, fe, ha, he, ir, le, lo, la, mi, me, no, ni, oí, si, se, su, te, tu, ti, ve, va, ya, yo, etc. Remind players that the names of letters are short words in Spanish: ene, pe, eme, be, ce, ge, etc. Even if you’re not playing competitively, this strategy of making short words will help kids participate. It also keeps them thinking about syllables which will help them form other words. (It is also a key strategy at any level of the game). Remind more advanced learners to use verb tenses and moods. They may want to make the verb form toma, for example, but not have an a. Remind them that tome and tomé are also words. – Play with the draw pile face up, so players can draw letters that help them. – Work together to form words instead of playing a competitive game. – Play that the first person to make 5 words wins. – Play making separate (rather than connected) words. Spanish Bananagrams is one of my go-to games for one-on-one play, small groups, or centers. The size and shape of the letters appeals tremendously to children, so they want to hold them, stack them and rearrange them. You will be surprised at the creative ways they find to use interact with the letters and build Spanish words. Many thanks to Bananagrams for sponsoring Summer Spanish Read and Play and for many, many hours of fun with my own family!